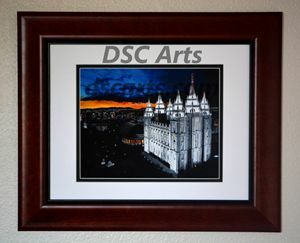 This is an 8 x 10 inch print of my original 24 x 30 inch acrylic painting of the Salt Lake Temple. The print is made with high quality paper with a 0.25 inch border around the image. FRAME NOT INCLUDED so you can be free to best match your home decor. Please feel free to ask any questions by contacting me at DSCArts5@gmail.com. You can also email me if you would like a different size of print or would like it on a different medium. You can also view some other works that I did by visiting www.dscarts.com. Print will be signed by artist. 8x10 inch print of original painting.